Elevated arsenic, chromium, mercury, and nickel levels may diminish sediment quality in parts of Isthmus Slough, the Upper Bay, and North Slough. Documented releases of metals, tributyltin, petroleum, and other industrial chemicals have occurred primarily in Isthmus Slough and the Upper Bay; toxicity risk is compounded by elevated levels of organic carbon and fine-grained sediment. Historically, sediment in the Coos Estuary has been relatively uncontaminated by pesticides. Effects Range Low (ERL) – lowest 10th percentile of concentrations associated with harmful biological effects. Effects Range Median (ERM) – 50th percentile of concentrations associated with harmful biological effects. ERL and ERM are commonly used by public agencies to evaluate the health of estuarine sediment. 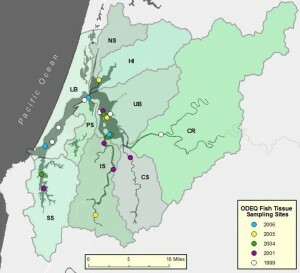 A variety of contaminants generated from urban, agricultural, and industrial activities in the Coos estuary and surrounding lands can find their way into coastal waters, where they can accumulate in sediments, posing threats to organisms throughout the estuarine food web, including humans (USEPA 2012). The status of these sediment contaminants is evaluated using two metrics: Effects Range Low (ERL) and Effects Range Median (ERM)(Table 1)(see sidebar at right). 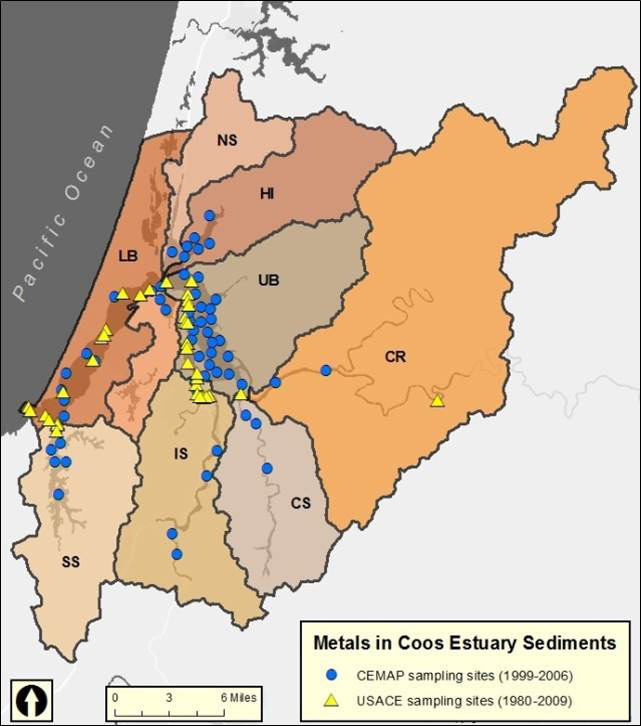 The Oregon Department of Environmental Quality (ODEQ) has monitored the metal content of sediments in the Coos Estuary since 1999 as part of their Coastal Environmental Monitoring and Assessment Program (CEMAP)(ODEQ 1999, 2001, 2002, 2004, 2005, 2006). Additionally, the United States Army Corps of Engineers (USACE) has recorded the status of metals in local sediments since 1980 in a series of sediment quality evaluation reports (USACE 1980, 1989, 1994, 1998, 2004, 2009). Figure 2 shows the spatial distribution of the sampling sites associated with those two programs. Collectively, the CEMAP data and the USACE reports represent over 1,000 “true detects” (i.e., observations above the minimum detection limit) for arsenic, cadmium, chromium, copper, mercury, nickel, silver, and zinc. 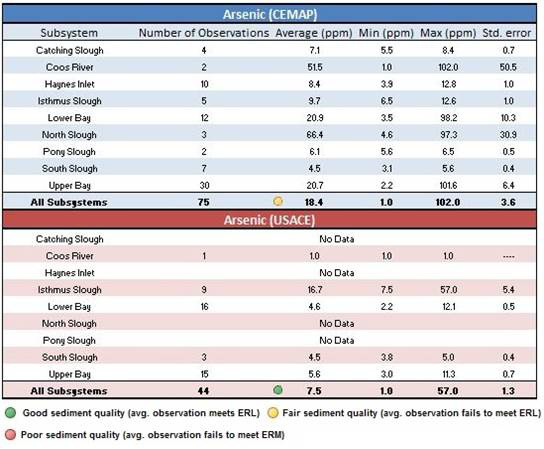 Generally, these observations indicate good to fair sediment quality, with 74% of all CEMAP true detects and 87% of all USACE true detects meeting the ERL criteria. However, slightly elevated levels of arsenic, chromium, mercury, and nickel may be of concern (Figure 3). Arsenic concentrations in Coos Estuary sediment suggest good to fair sediment quality (Table 2). USACE data show that the mean arsenic level (7.5 ppm) meets the ERL criteria (USACE 1980, 1989, 1994, 1998, 2004, 2009). However, the CEMAP data indicate a mean arsenic level (18.4 ppm) that fails to meet the ERL criteria (ODEQ 1999, 2001, 2002, 2004, 2005, 2006). Maximum mean arsenic concentrations occurred in the North Slough subsystem (CEMAP, 66.4 ppm) and Isthmus Slough (USACE, 16.7 ppm). Although these maxima failed to meet the ERL standard, both met the ERM criteria. 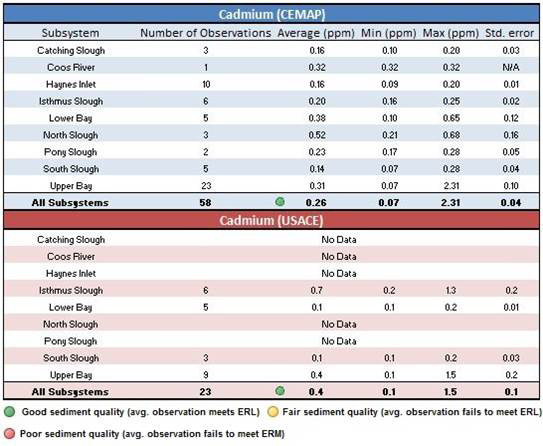 Cadmium data suggest good sediment quality throughout the study area (Table 3). 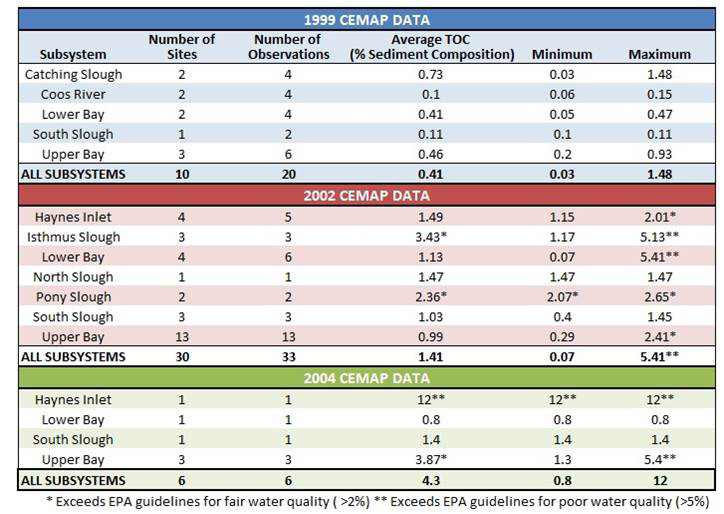 Mean cadmium concentrations for all subsystems easily meet the ERL criteria for both CEMAP (0.26 ppm) and USACE (0.4 ppm) data (ODEQ 1999, 2001, 2002, 2004, 2005, 2006; USACE 1980, 1989, 1994, 1998, 2004, 2009). 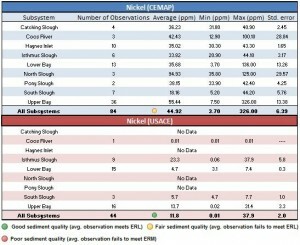 Average chromium levels indicate good to fair sediment quality (Table 4). USACE (1980, 1989, 1994, 1998, 2004, 2009) data indicate that average chromium concentrations for all subsystems (14.9 ppm) easily meet the ERL criteria. However, the CEMAP data show that average chromium levels (87 ppm) fail to meet the same criteria (ODEQ 1999, 2001, 2002, 2004, 2005, 2006). Elevated mean chromium levels are primarily due to high chromium concentrations in the North Slough subsystem, which were recorded during the 2002 CEMAP monitoring effort (ODEQ 2002). 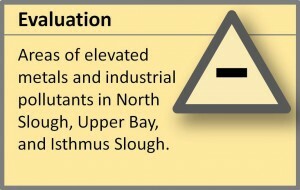 The 2002 CEMAP data are the most current data for North Slough. No CEMAP sampling has occurred in North Slough since 2002; the USACE has not collected data in North Slough. 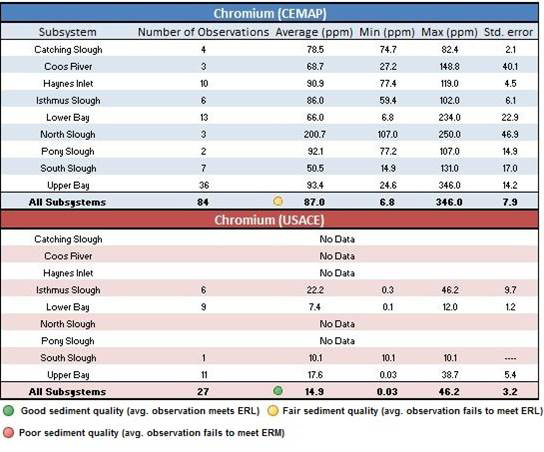 Four sites in the Isthmus Slough, Lower Bay, and South Slough subsystems are listed on ODEQ’s Confirmed Release List (CRL) for the documented release of chromium (see Why is it happening? )(ODEQ n.d.). The Coos Estuary is typical of a regional pattern of relatively low sediment contamination. In 2002, the USEPA conducted a survey of soft sediment habitat in the estuaries of Washington, Oregon, and California (Nelson et al. 2007). They examined sediment toxicity by calculating the Effects Range Median Quotient (ERM-Q), which is intended to be an indicator of overall sediment contamination. An ERM-Q < 0.1 corresponds to low probability (11.6%) of sediment toxicity (Long et al. 1995). Most Coos estuary stations easily met the low toxicity risk benchmark. Only one station (Pony Slough subsystem) failed to meet the benchmark (Figure 6). ODEQ monitors pesticides, tributyltin (TBT), and PCBs in the Coos estuary as part of their Coastal Environmental Monitoring and Assessment Program (CEMAP). CEMAP monitoring was conducted in 1999, 2001, 2002, 2004, 2005, and 2006 at 60 Coos estuary sites (Figure 7). The CEMAP data indicate little exposure to pesticides, PCBs, or TBT in the Coos estuary. Between 1999 and 2006, CEMAP recorded nearly 2,500 observations in the study area. Just over 1 percent of all CEMAP observations were “true detects” (40 observations)(i.e., above reporting limits)(Table 12). USACE also evaluates sediment quality by comparing sediment contaminant levels to a “screening level,” which is used to determine the acceptability of management alternatives for dredged materials (Sediment Evaluation Framework for the Pacific Northwest 2009). From 1989 to 2009, the USACE evaluated Coos sediments for several contaminants including pesticides and PCBs, TBT and other butyltin compounds, PAHs, total petrolium hydrocarbons (TPH), chlorinated hydrocarbons, phenols, phthalates, and “miscellaneous extractables” (see Figure 2)(USACE 1980, 1989, 1994, 1998, 1999, 2004, 2009). Copper concentrations indicate good to fair sediment quality throughout the study area (Table 5). 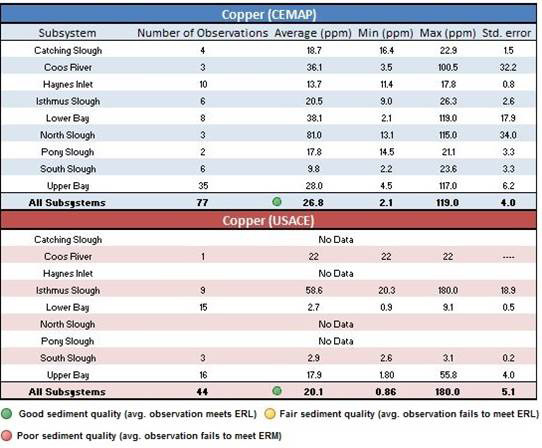 Mean copper concentrations for all subsystems meet the ERL criteria for both CEMAP (26.8 ppm) and USACE (20.1 ppm) data (ODEQ 1999, 2001, 2002, 2004, 2005, 2006; USACE 1980, 1989, 1994, 1998, 2004, 2009). 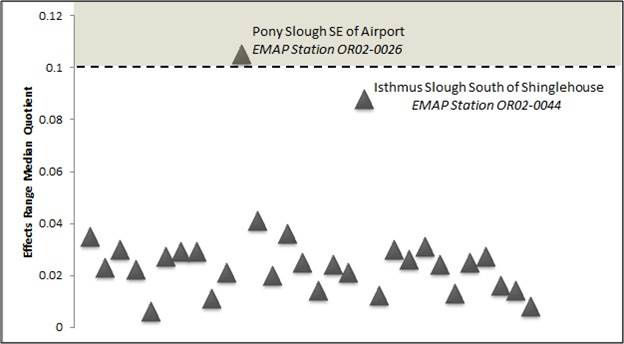 Average concentrations for individual subsystems were highest in the North Slough (81 ppm) and Isthmus Slough (58.6 ppm), where mean concentrations failed to meet the ERL criteria (CEMAP 2002; USACE 1994, 2004, 2009). Four sites in the Isthmus Slough, Lower Bay, and South Slough subsystems are listed on ODEQ’s CRL for the document release of copper (see Why is it happening? )(ODEQ n.d.). Lead concentrations averaged across all subsystems met the ERL criteria (Table 6)(ODEQ 1999, 2001, 2002, 2004, 2005, 2006; USACE 1980, 1989, 1994, 1998, 2004, 2009). 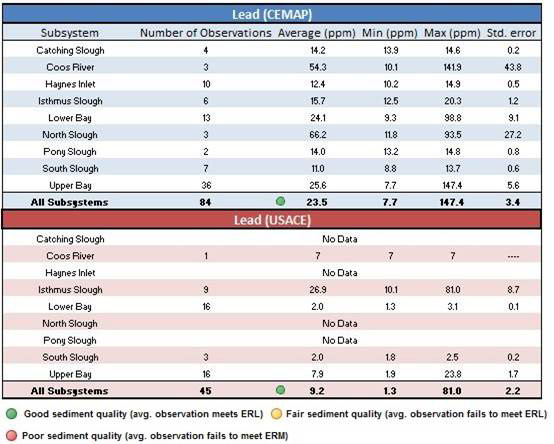 The CEMAP data show that average lead concentrations exceed the ERL criteria in the North Slough (66.2 ppm) and Coos River (54.3 ppm) subsystems (ODEQ 1999, 2001, 2002, 2004, 2005, 2006). There is one site in the Upper Bay Subsystem that is listed on ODEQ’s CRL for the document release of lead (see Why is it happening? )(ODEQ n.d.). 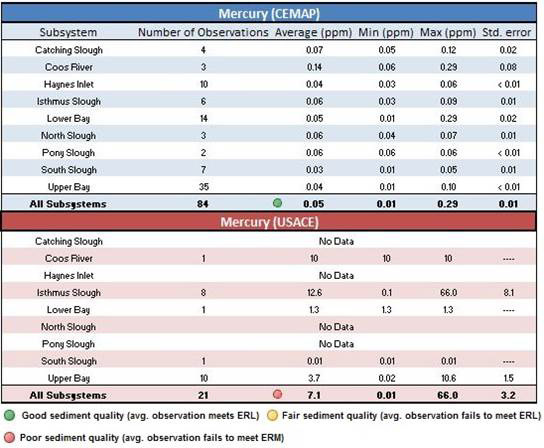 Mercury levels generally indicate good sediment quality; however, elevated levels in Isthmus Slough suggest localized areas of poor quality sediment (Table 7)(ODEQ 1999, 2001, 2002, 2004, 2005, 2006; USACE 1980, 1989, 1994, 1998, 2004, 2009). There is one site in the South Slough Subsystem that is listed on ODEQ’s CRL for the document release of mercury (see Why is it happening? )(ODEQ n.d.). Although data sources are somewhat conflicting, elevated nickel concentrations in Coos sediments may represent fair to poor sediment quality (Table 8). 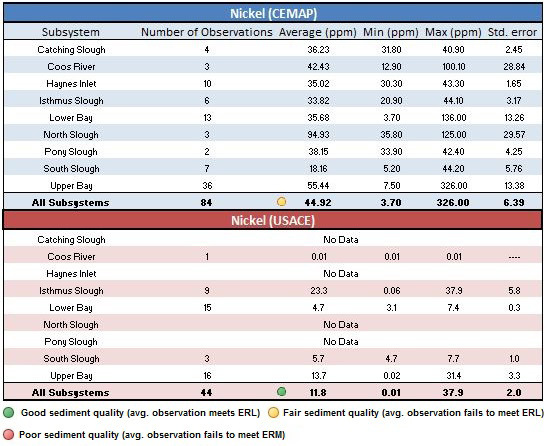 CEMAP data show that the mean nickel concentration, averaged across all subsystems, fails to meet the ERL criteria (ODEQ 1999, 2001, 2002, 2004, 2005, 2006). This is primarily due to elevated nickel concentrations in North Slough (94.9 ppm) and Upper Bay (55.44 ppm), both of which failed to meet the ERM criteria (ODEQ 1999, 2002, 2004, 2005, 2006). CEMAP data also indicate that six of the remaining seven subsystems fail to meet the ERL criteria, with the exception of South Slough (18.2 ppm). 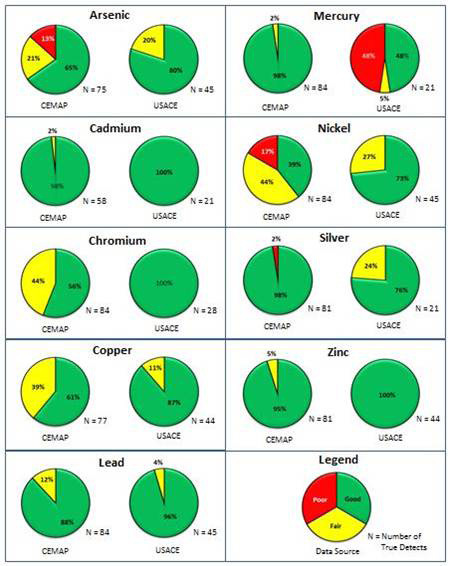 Contrary to CEMAP, USACE (1980, 1989, 1994, 1998, 2004, 2009) data suggest that mean nickel concentrations easily meet the ERL critieria in most subsystems. However, elevated nickel levels in the Isthmus Slough subsystem (23.3 ppm) failed to meet the ERL criteria. Five sites in the Isthmus Slough, Lower Bay, and South Slough Subsystems are listed on ODEQ’s CRL for the document release of nickel (see Why is it happening? )(ODEQ n.d.). 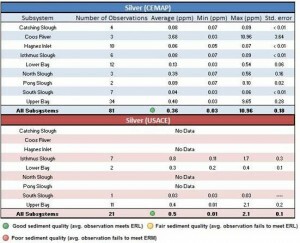 Silver concentrations indicate generally good sediment quality throughout the study area (Table 9). 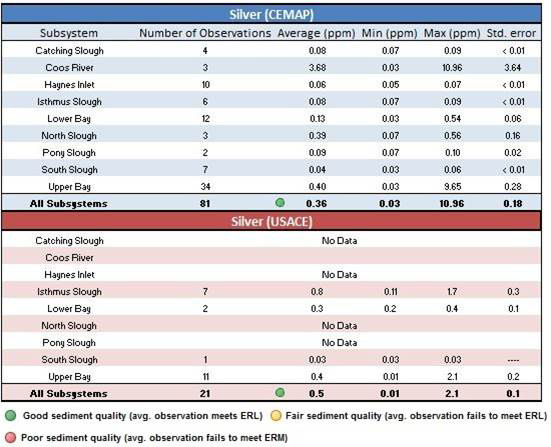 However, CEMAP data suggest that silver concentrations in Coos River sediments (3.68 ppm) failed to meet the ERL criteria (ODEQ 1999). It should be noted that these are 1999-era data, and the Coos River subsystem has not been monitored by CEMAP since. 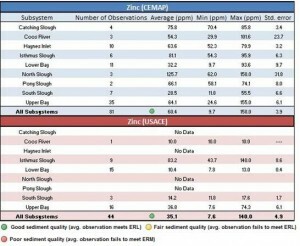 Zinc concentrations suggest good sediment quality throughout the study area (Table 10) ODEQ 1999, 2001, 2002, 2004, 2005, 2006; USACE 1980, 1989, 1994, 1998, 2004, 2009). 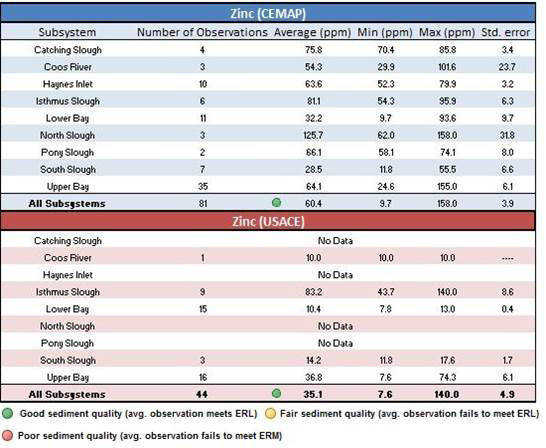 Three sites in the Isthmus Slough and Lower Bay Subsystems are listed on ODEQ’s CRL for the documented release of zinc (see Why is it happening? )(ODEQ n.d.). Contaminants may accumulate in the fatty or muscle tissue of fish and shellfish. Even low levels of contaminants in the water column or sediment may result the contamination of recreationally or commercially harvested fish and shellfish that can result in serious human health risks (USEPA 2000). 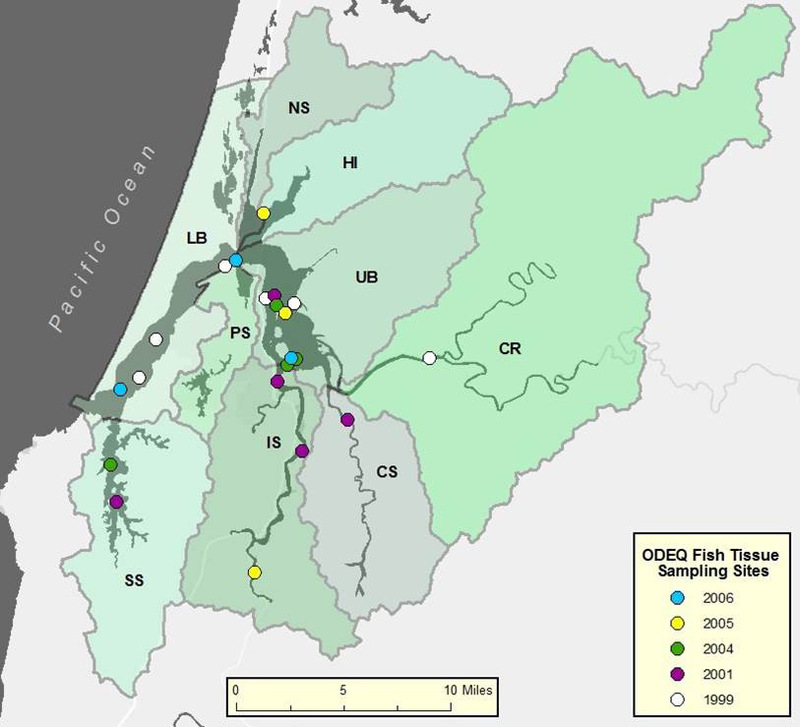 ODEQ (1999, 2001, 2004, 2005, 2006) collected data detailing tissue contamination in bottom dwelling fish from sites in the Lower Bay, Upper Bay, South Slough, and Coos River subsystems as part of their CEMAP monitoring program (Figure 4). These data are summarized in Table 11. The ODEQ data are difficult to interpret because the development of human health standards for safe fish consumption requires making numerous assumptions about people’s dietary preferences, body type (e.g., body weight, age), level of risk aversion, and other variables (USEPA 2000). However, some indication about the overall suitability of fish for human consumption in the Coos Estuary is provided by the National Listing of Fish Advisories, a compendium created by the United States Environmental Protection Agency (USEPA) to alert the public of any potential health hazards. Similarly, the Oregon Division of Public Health maintains a listing of active fish advisories and consumption guidelines in Oregon (OR Health Division n.d.). For additional information regarding nationally recommended safe consumption limits, refer to Volume 2 of USEPA’s “Guidance for Assessing Chemical Contaminant Data for Use in Fish Advisories” (USEPA 2000). Long et al. 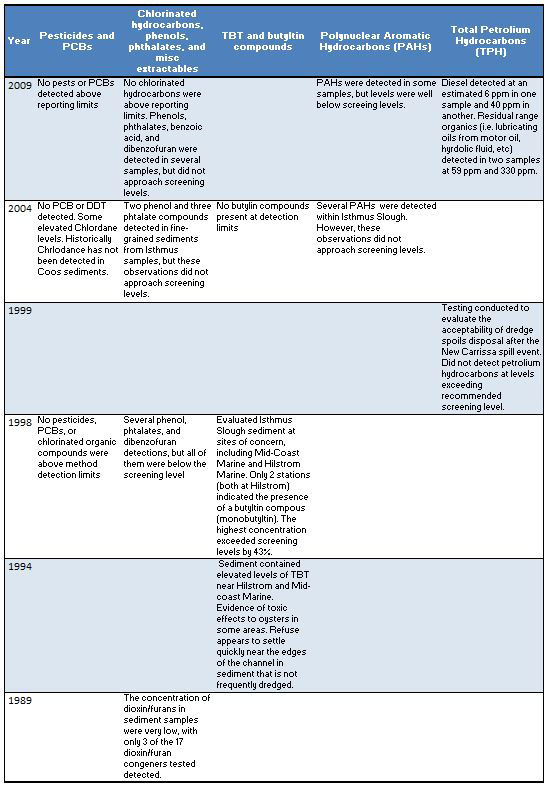 (1995) established sediment quality guidelines (SQG) for a series of commonly occurring synthetic organic contaminants, including polycyclic aromatic hydrocarbons (PAHs), polychlorinated biphenyls (PCBs), and dichlorodiphenyltrichloroethane (DDT)(Table 1). These SQGs use the ERL and ERM evaluation criteria (see Guidelines for Assessing Sediment Quality sidebar). With respect to synthetic organic contaminants and pesticides, sediment quality in Pacific Northwest estuarine sediments has historically been relatively good. In 1999 and 2000, the USEPA sampled 8,670 square kilometers (3,348 square miles) of estuarine sediment in Oregon and Washington as part of their Environmental Monitoring and Assessment Program (EMAP)(Hayslip et al. 2006). 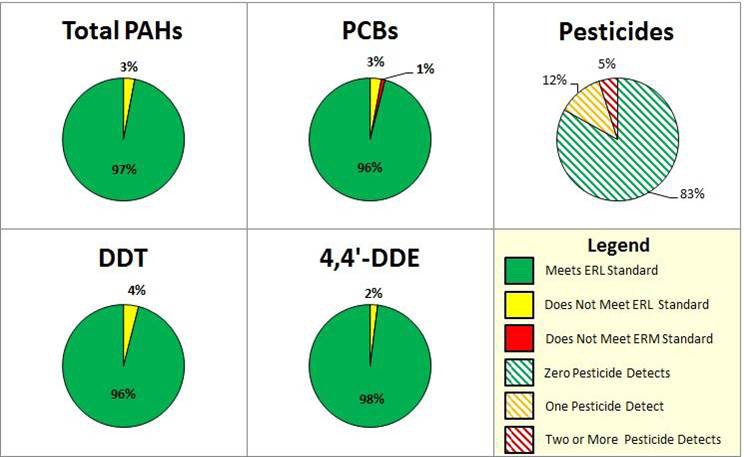 Their data suggest limited exposure to pesticides and other synthetic organic contaminants (Figure 5). Generally, chemical analyses indicated very little sediment contamination. Many of the USACE observations were below reporting limits (Table 13). However, in 1994, testing at Mid-coast Marine and Hilsrom Marine (two formerly operational shipbuilding sites in Isthmus Slough) revealed elevated TBT levels (USACE 1994). Since 1986, the National Oceanic and Atmospheric Administration (NOAA) has monitored sediment contamination at two Coos estuary sites for their Mussel Watch Contaminant Monitoring Program (Figure 8)(NOAA 1986, 1996, 2006). 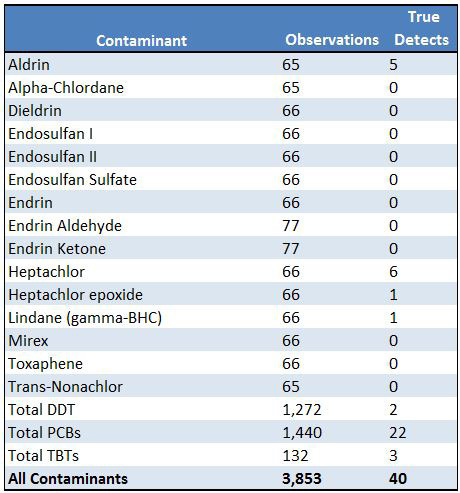 The NOAA data set includes 216 observations for contaminants with established SQGs (See Table 1 for SQGs). All of these observations met the SQGs (Table 14). Total Organic Carbon (TOC) occurs naturally in estuarine sediments, but elevated TOC can change the “benthic” (i.e., sea floor) environments, deplete oxygen levels (ODEQ 2014, Pearson and Rosenberg 1978), and can be associated with the presence of other pollutants (Hyland et al. 2005). In the 2012 National Coastal Condition Report, USEPA outlines sediment quality standards for TOC (Table 15). According the USEPA, TOC levels in Oregon coast sediments generally meet the criteria for good sediment quality (Figure 9)(Nelson et al. 2007). 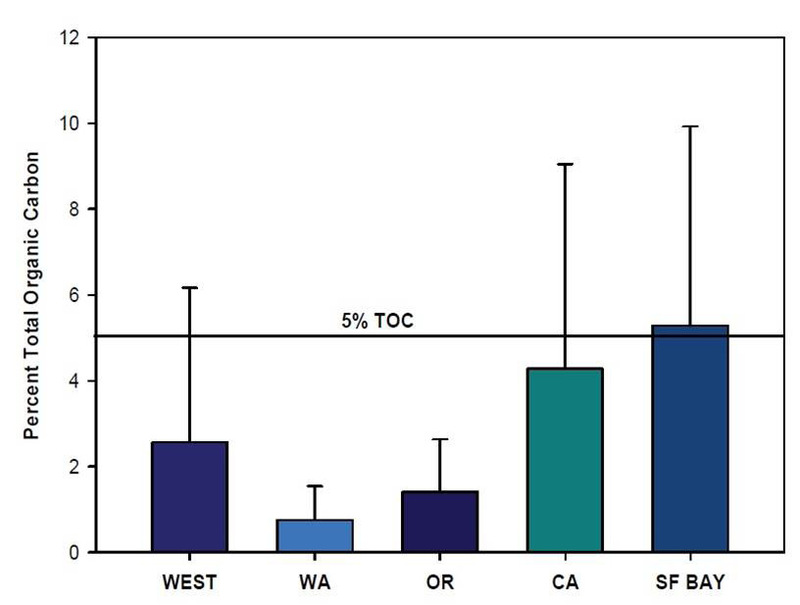 In 2002, less than 2% of estuarine sediment on the Oregon coast had TOC levels associated with poor quality sediment ( > 5% TOC)(Nelson et al. 2007). The regional trend for low TOC is reflected in Coos Estuary sediments. 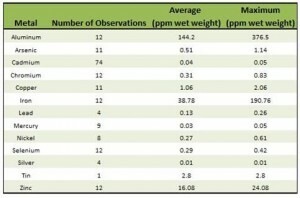 Lee II and Brown (2009)(Western Ecology Division of the USEPA) reported that median Coos estuary TOC levels were the second highest in the state, but overall sediment quality was still high (TOC < 1% of sed. composition)(Table 16). The USACE has maintained records of TOC in Coos Bay sediments since 1980 for the the Lower and Upper Bay subsystems (USACE 1980, 1989, 1994, 1998, 2004, 2009). 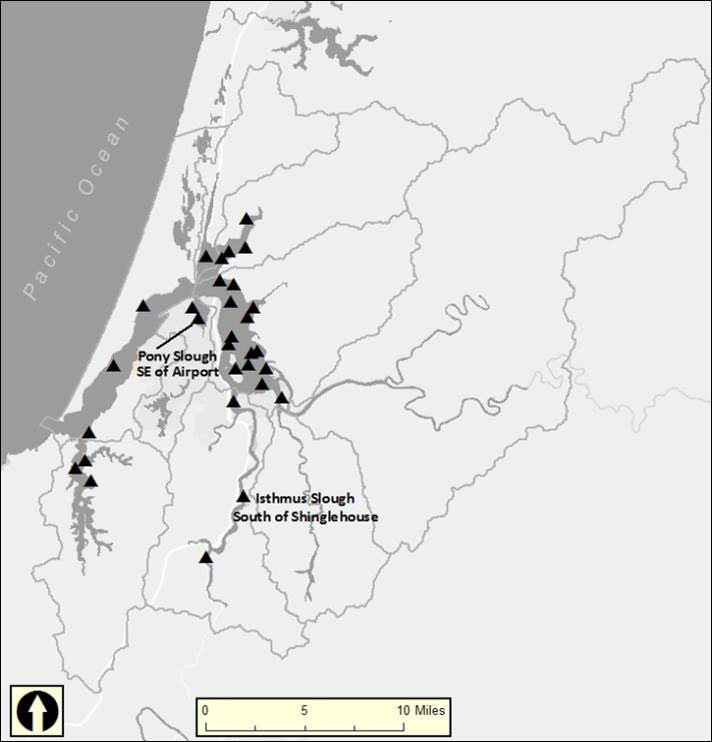 A few samples were also collected in the South Slough (1998 and 2004), Pony Slough (1998), Isthmus Slough (1898, 1994, 2004, and 2009), and Coos River (1980)(see Figure 2). USACE records indicate that the organic content of Coos River sediments has historically been low, and, in the Upper Bay Subsystem, “TOC [concentrations]… were typical of uncontaminated coastal and estuarine sediment” (USACE 1980, 1989). TOC was monitored in all nine project area subsystems (see Figure 2) as part of the Coastal Environmental Monitoring and Assessment Program (CEMAP) in 1999, 2002, and 2004 (ODEQ 1999, 2002, 2004). n 1999, TOC levels easily met the USEPA recommended water quality criteria (ODEQ 1999). Observations in 2002 generally met USEPA guidelines. However, there were instances of fair to poor sediment quality (2-5% TOC) in Haynes Inlet, Pony Slough, Isthmus Slough, and the Upper and Lower Bay subsystems (ODEQ 2002). In 2004, CEMAP observations suggested good sediment quality in the Lower Bay and South Slough subsystems and fair to poor sediment quality in the Upper Bay and Haynes Inlet. 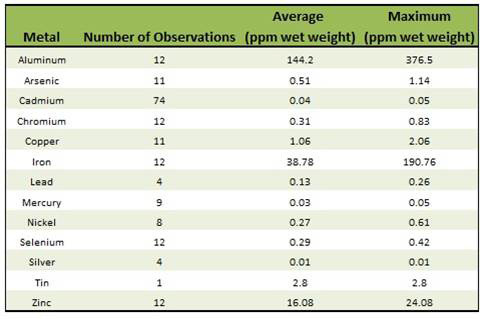 TOC levels in Haynes Inlet were more than double USEPA’s recommended values (Figure 11 and Table 17)(ODEQ 2004). In 2006, ODEQ measured TOC in Isthmus Slough (ODEQ 2007). Sediment quality was fair to poor, with only one measurement indicating good sediment quality (Figure 12). Metals, synthetic organic contaminants, chlorinated pesticides, and other pollutants can enter estuaries from a variety of sources, including effluent from nearby industry or agriculture activities (USEPA 2002). Many metals (e.g., iron, copper) are also naturally abundant elements found in coastal watersheds (Shacklette and Boerngen 1984; USEPA 2007b). Contaminants that enter estuaries are often adsorbed onto suspended particles that eventually settle into depositional basins, where they enter the sediment (USEPA 2002). Some metals (e.g., copper and zinc) are a necessary part of a healthy estuarine environment, because they facilitate important metabolic functions (USEPA 2002, USEPA 2006). Other metals (e.g., mercury, lead, chromium, and cadmium) have no known metabolic function (USEPA 2006). The toxicity of contaminants in sediment is determined by several factors, including the physical characteristics of the sediment (e.g., grain size and organic content) as well as other chemical and environmental factors such as pH, redox potential (i.e., the tendency of a contaminant to acquire electrons), water hardness, organic content, and the availability of other pollutants or binding agents (Bentivegna et al. 2004; USEPA 2002, 2007a; Flemming and Trevors 1989). Since toxic responses in plants and animals require the transfer of chemicals from the environment to biochemical receptors on or in an organism, the toxicity of these pollutants may also depend on species-specific physiology (USEPA 2007b). 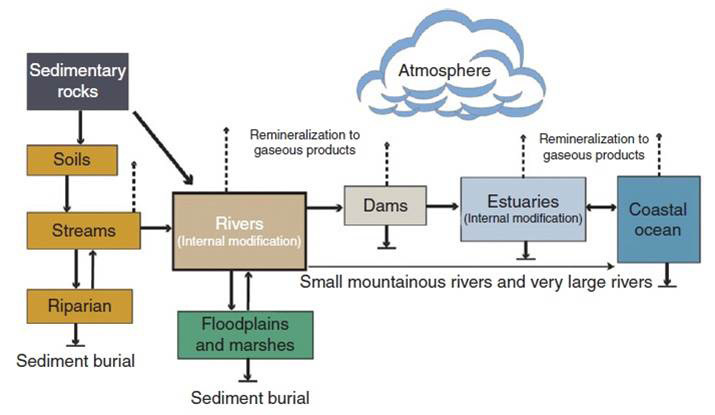 Estuaries are complex interfaces between terrestrial, marine, and atmospheric organic carbon (OC) sources, both naturally occurring and human-generated (Bauer and Bianchi 2011)(Figure 14). Estuarine OC may be lost through naturally occurring geological mechanisms (e.g., sedimentation and remineralization) as well as chemical processes (e.g., flocculation and precipitation)(Bauer and Bianchi 2011). Figure 7. CEMAP observations (1999-2006). Observation sites are classified into three categories including non-detection (light blue), detection below reporting limits (dark blue), and detection above reporting limits (yellow). Reporting limits are the smallest concentration of an analyte that can be measured by a laboratory. There are multiple observations at each site. Non-detection means that the contaminant has never been observed at that site. 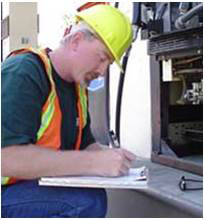 Detection means that the contaminant has been observed at least once since 1999. Data: ODEQ 1999, 2001, 2002, 2004, 2005, 2006.
locations Data: NOAA 1986, 1996, 2006. 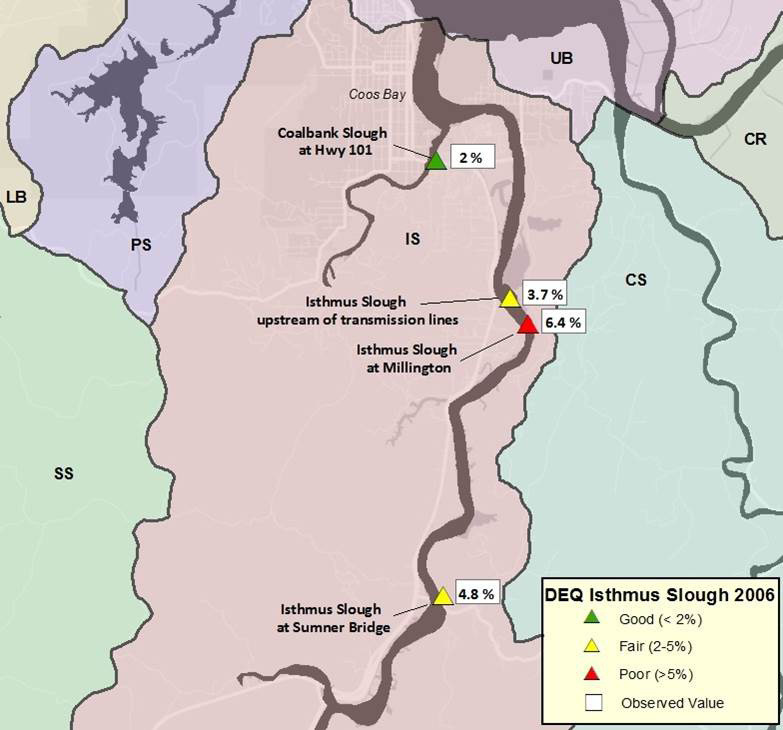 In 1994, the USACE evaluated sediment quality near Hilstrom Marine and Mid Coast Marine, two formerly operational boat repair sites in Isthmus Slough (USACE 1994). By current standards, the average sediment quality at both Hilstrom (2.85% TOC) and Mid Coast Marine (4.87 % TOC) was fair, but Mid Coast Marine sediment tended towards poor quality, with four of the five samples exceeding 5% TOC. In more recent years, USACE data have indicated good sediment quality on average in some subsystems (e.g., South Slough and Lower Bay) and fair sediment quality in others (e.g., Upper Bay and Isthmus Slough)(Figure 10). (1986-2006) Data: NOAA 1986, 1996, 2006. TOC in suspension has been measured sporadically from 1995-2012 in the South Slough, Isthmus Slough, Coos River, Pony Slough, and Lower Bay subsystems (ODEQ 2001, 2007, 2009a, 2009b, Water Board 2012). Generally, TOC concentrations in these subsystems range between 3-4 mg/L. However, anomalously high TOC levels were measured near the Joe Ney Construction Debris Landfill in South Slough, with several instances of concentrations ranging from 20-42 mg/L and once instance of 60 mg/L (ODEQ 2009a). For more detail, refer to the Organic Carbon section of the Water Quality Chapter. 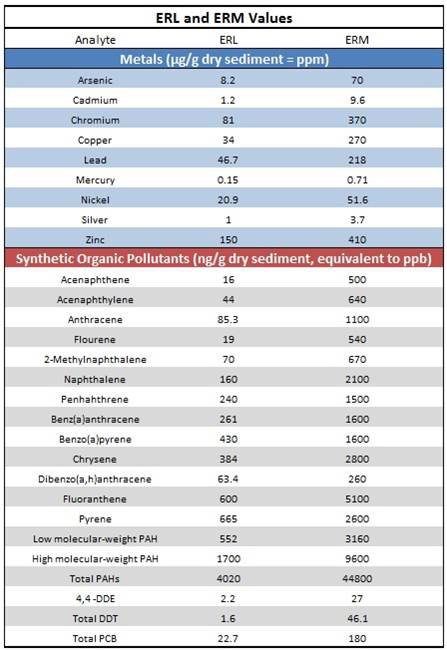 There are many potential sources of metals, synthetic organic pollutants, chlorinated pesticides, petroleum hydrocarbons, and other pollutants in estuarine sediment (USEPA 2002). The toxicity of these chemicals in estuarine sediment depends on several factors (Bauer and Bianchi 2011; USEPA 2002, 2007a; Bentivegna et al. 2004; Flemming and Trevors 1989). As a result, it can be difficult to determine sediment contaminant sources. Despite these difficulties, several tools have been developed to track potential contaminant sources, including USEPA’s Toxic Release Inventory (TRI) and “Brownfield” site listings as well as ODEQ’s Environmental Cleanup Site Information (ECSI) program. It’s important to note that these programs often list sites as “potential” or “suspected” sources of pollution. Therefore, registry with these programs does not necessarily mean that a facility is responsible for the release of pollutants into the environment. Supplemental details about the sites that are enrolled in these programs can be found in the online databases (ODEQ n.d., USEPA 2014b). In addition to ECSI, ODEQ also manages a confirmed release list (CRL). 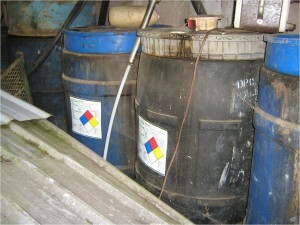 Registry with the CRL means that the release of pollutants has been confirmed and documented at that site (ODEQ n.d.). There are 3 TRI sites, 4 Brownfield sites, and sixty ECSI sites in the study area (ODEQ n.d., USEPA 2014a)(Figure 13). Although there are sites in all 9 subsystems, the majority (61%) of these sites are located in the Isthmus Slough and Upper Bay Subsystems (ODEQ n.d., USEPA 2014a). These sites represent a potential source of contamination to the soil, groundwater, surface water, and sediment. They’re listed for a variety of reasons, including but not limited to mismanagement of hazardous wastes, accidental spills, and historic practices that are presently ill-advised. The suspected pollutants include metals, PCBs, PAHs, TPH, TBT, dioxins, and other industrial chemicals (e.g., wood preservation chemicals). 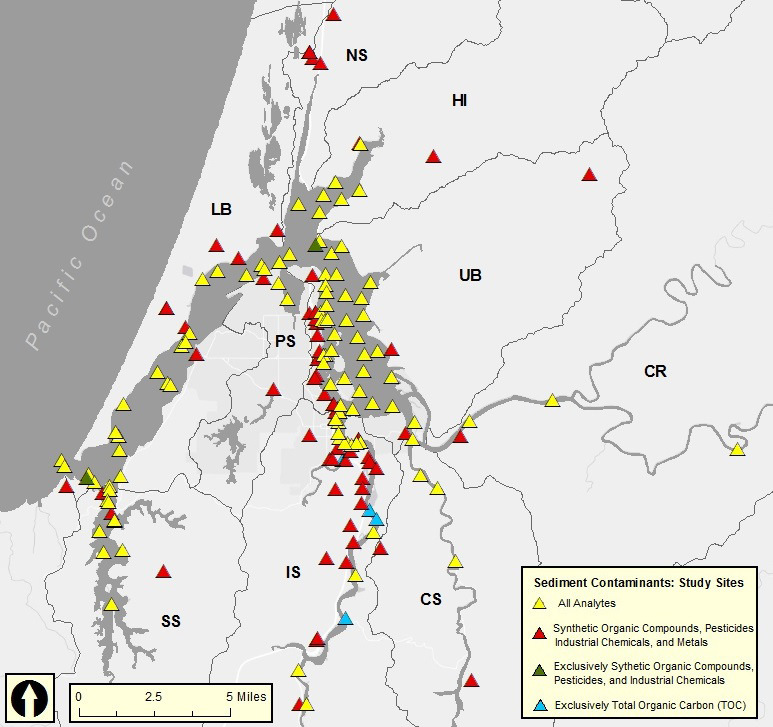 Fourteen of the 60 ECSI sites in the study area are CRL sites, meaning that the release of pollutants has been documented in nearly a quarter (23%) of all ECSI sites (ODEQ n.d.). 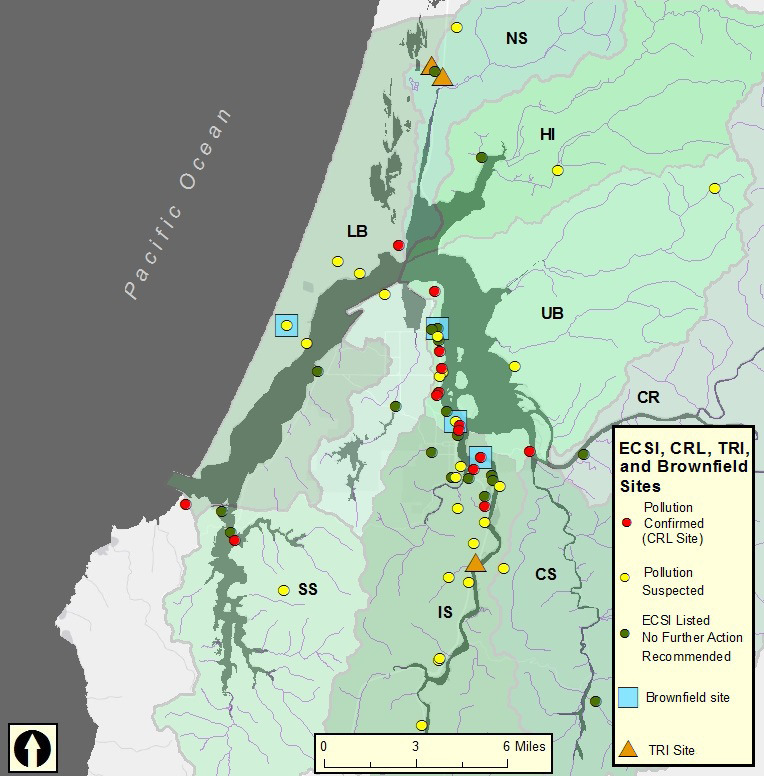 Similar to all ECSI, the majority (78%) of these CRL sites are in the Upper Bay and Isthmus Slough Subsystems (Figure 13). These CRL sites are industrial properties, including boat building, metal works, lumber mills, and fueling stations. They are listed for mismanagement and improper disposal of pollutants resulting in the confirmed release of metals, PCBs, PAHs, TPH, TBT, and other industrial chemicals into the soil, groundwater, surface water, or sediment. Estuarine carbon cycling is influenced by human activities (e.g., wetland drainage, damming and diversion of waterways, and other land use changes, as well as aerosol sources such as fossil fuel combustion and biomass burning). These activities have the potential to rapidly change and further complicate an already intricate process (Bauer and Bianchi 2011). Organic matter (OM), such as TOC, is an important source of food for benthic fauna. However, an overabundance of OM in the sediment may reduce biodiversity, because the decomposition of excess OM is associated with oxygen depletion and the accumulation of toxic by-products (e.g., ammonia and sulphide)(Hyland et al. 2005, Diaz and Rosenberg 2008). Excess OM may also be accompanied by increases in chemical pollutants, because high OM levels require some of the same environmental factors that facilitate increases in other contaminants (e.g., increase in finer-grained sediments that allow a greater surface area for adsorption)(Hyland et al. 2005). Pearson and Rosenberg (1978) have modeled of benthic response to increasing OM levels (Figure 15). In their model, low OM levels (Figure 15, Zone 1) result in high species richness due to the combined effects of the sufficient food availability and few environmental stressors. Over the intermediate OM range (Zone 2), species richness declines, because sensitive organisms are unable to withstand increasing exposure to environmental stressors (e.g., depleted oxygen, toxic by-products of OM decomposition, and increased chemical contaminants). However, hardier/opportunistic species may be tolerant of increased OM levels, resulting in a net increase in species abundance and a secondary peak in biomass. At high OM levels (Zone 3), environmental stressors exceed most tolerance levels; consequently, there is a precipitous loss of biodiversity. Bauer J.E. and Bianchi T.S. 2011. Dissolved Organic Carbon Cycling and Transformation. In: Wolanski E. and McLusky D.S. (eds.) Treatise on Estuarine and Coastal Science, Vol 5, pp. 7–67. Waltham: Academic Press. Accessed from http://aquaticbiogeochem.osu.edu/sites/aquaticbiogeochem.osu. Bentivegna, Carolyn S., Joy-Elaine Alfano, Sean M. Bugel, and Katarzyna Czechowicz. 2004. Influence of Sediment Characteristics on Heavy Metal Toxicity in an Urban Marsh. Urban Habitats. Vol. 2 (1) pp. 91-111. Burdige, D.J. 2006. Geochemistry of Marine Sediments. Princeton University Press: Princeton, NJ, 609 pp. Coos Bay/North Bend Water Board (Water Board). 2012. [Drinking Water Program Data]. Unpublished raw data. Accessed 15 April 2014 from the Estuarine and Coastal Sciences Laboratory of the South Slough National Estuarine Research Reserve. Diaz, R.J. and R. Rosenberg. 2008. Spreading dead zones and consequences for marineecosystems. Science 321: 926-929. Flemming, C.A. and J.T. Trevors. 1989. Copper Toxicity and Chemistry in the Environment: A Review. Water, Air, and Soil Pollution 44: 145-158. Hayslip, G., L. Edmond, V. Partridge, W. Nelson, H. Lee, F. Cole, J. Lamberson , and L. Caton. 2006. Ecological Condition of the Estuaries of Oregon and Washington. EPA 910-R-06-001. U.S. Environmental Protection Agency, Office of Environmental Assessment, Region 10, Seattle, Washington. Hyland, J., L. Balthis, I. Karakassis, P. Magni, A. Petrov, J. Shine, and R. Warwick. 2005. Organic carbon content of sediments as an indicator of stress in the marine benthos. Marine Ecology Progress Series, 295(9). Long, E. R., D. D. MacDonald, S. L. Smith, and F. D. Calder, 1995. Incidence of adverse biological effects within ranges of chemical concentrations in marine and estuarine sediments. Environmental Management 19(1): 81-97. National Oceanic and Atmospheric Administration (NOAA). 1986. [National Center for Coastal Monitoring and Assessment, Mussel Watch Contamination Monitoring Program]. Raw data. 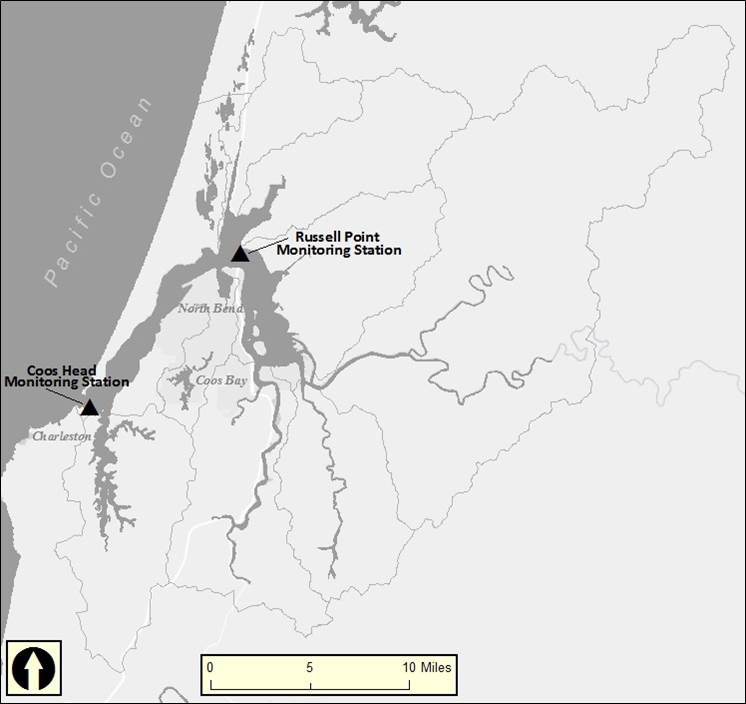 Accessed from the Estuarine and Coastal Sciences Laboratory of South Slough National Estuarine Research Reserve on 7 August, 2014. National Oceanic and Atmospheric Administration (NOAA). 1996. [National Center for Coastal Monitoring and Assessment, Mussel Watch Contamination Monitoring Program]. Raw data. Accessed from the Estuarine and Coastal Sciences Laboratory of South Slough National Estuarine Research Reserve on 7 August, 2014. National Oceanic and Atmospheric Administration (NOAA). 2006. [National Center for Coastal Monitoring and Assessment, Mussel Watch Contamination Monitoring Program]. Raw data. Accessed from the Estuarine and Coastal Sciences Laboratory of South Slough National Estuarine Research Reserve on 7 August, 2014. Nelson, Walter G, Henry Lee II, Janet O. Lamberson, Faith A. Cole, Christine L. Weilhoefer, and Patrick J. Clinton. 2007. The Condition of Tidal Wetlands of Washington, Oregon, and California – 2002. Office of Research and Development. National Health and Environmental Effects Research Laboratory, EPA/620/R-07/002. Oregon Department of Environmental Quality (ODEQ). 2014. Basin Status Report and Action Plan South Coast Baisin –December 2013. [Unpublished draft]. Sediment Evaluation Framework for the Pacific Northwest. 2009. Table 6-3: Bulk Sediment Screening Levels for Chemicals of Concern. United States Army Corps of Engineers (USACE). 1980. Factual Determinations of Dredged Material Disposal Operations Coos River Federal Navigation Project [Coos Bay Sediment Sampling Evaluation Report 1980]. United States Army Corps of Engineers (USACE). 1989. Results of 1989 Coos Bay Empire Turning Basin Sediment Quality Evaluation [Coos Bay Sediment Sampling Evaluation Report 1989]. United States Army Corps of Engineers (USACE). 1994. Supplemental TBT Data for the Coos Bay Channel Deepening Project [Coos Bay Sediment Sampling Evaluation Report 1994]. United States Army Corps of Engineers (USACE). 1998. Coos Bay Sediment Sampling Evaluation Report 1998. United States Army Corps of Engineers (USACE). 2004. 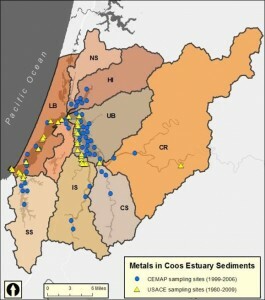 Coos Bay Sediment Quality Evaluation Report 2004.